This past Friday, I had the opportunity to go to Universidad Nacional in Heredia acnd attend the final presentation of a theater class which is actively using Theater of the Oppressed techniques. Before I came to Costa Rica, I became very interested in this type of theater. 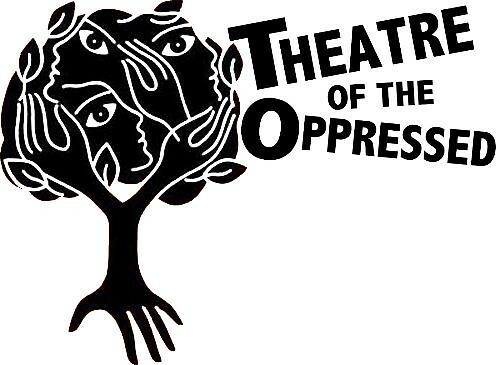 Pioneered in the early 1950’s by Brazilian Agosto Boal, Theater of the Oppressed focuses on transforming traditional modes of theater. His goal was to take theater away from the aristocracy and use it as a tool to TEACH the local people, teach them about human rights, the negative value of some social norms, and other forms of structural violence that dominate our daily lives. I had read about Boal and his techniques, but when I got here and tried to meet up with someone practicing those techniques, I could not find any leads. A few weeks ago, I overhead my Human Rights professor discussing Boal and his techniques with some other students in our class. I quickly jumped in and mentioned how I had been searching for someone in Costa Rica who was practicing his techniques. She told me she had a colleague who was teaching a class at a nearby university on that very subject! After some failed attempts at trying to connect with him, I was finally able to go see his class’ final performance. I was THRILLED by what I saw! The performance was split into 3 parts, each pertaining to a different aspect of the technique. The first part was dedicated to Invisible Theater. If you’ve ever seen “What would you do?” on tv, you already have an idea about this branch. But basically, throughout the course of the term, the students and professor would go into public spaces (parks, movie theaters, busses, even the university’s campus) and stage various forms of conflict to see how the public would react and to also create a dialogue within the community. They staged acts dealing with domestic abuse, racial discrimination, actually all forms of discrimination were addressed. For the final performance, they recreated many of those scenes on stage. The second part of the performance was composed of 4 small scenes which addressed cultural norms that exist, but the scenes were purely metaphorical (i.e. a man walks into a store filled with women, all of whom wear price tags. He has trouble deciding on “the one,” but when he does, he pulls his credit card out of his crotch). The third and final portion was by far my favorite and it focused on the Theater Forum. This portion too was composed of 4 short scenes, but instead of being metaphorically based, these were all scenes that could occur in real life. They dealt with domestic violence, homophobia, gender roles, and racial discrimination. After the scenes occurred, the director hopped on stage and asked the audience which scenes affected them the most, which scenes we would like to see replayed. We collectively voted to rewatch the scene dealing with gender roles. He told us to raise our hands and yell “stop!” whenever we saw something we did not like, or agree with, or something we thought could be changed. Whenever anyone yelled “stop!,” the director would ask why the action on stage made the audience member uncomfortable, then he would ask the same audience member to come up on stage, replace one of the protagonists, and act out the scene as they would in real life. It was so amazing to listen to the dialogue that this scene created within the audience, and then to see the scene be replayed with different outcomes was even more powerful. That is exactly what the Theater of the Oppressed was designed to do. To help people physically see their actions played out in front of them, understand why they may or may not work, and to create a dialogue with their peers on how to best respond to said situation. There is so much more I could say about that day and Theater of the Oppressed (I actually plan to write my thesis on this very topic), but I will stop myself here by saying how much I truly, truly enjoyed this experience.